This is Hannah. She is 22 years old. Her bio from the Save the Chimps website: “When we opened the doors to the transport truck we found Hannah sitting in her cage rocking back and forth furiously. She was almost immediately introduced to Gromek and since then her confidence and personality have grown. I read about Save the Chimps in People Magazine. Land in Florida was bought for chimps who had been part of some Air Force experiments. I sent them a donation. If you don’t want to send money, they also say they need care packages: more blankets, toys (toys suitable for infants and toddlers, basketballs, dog toys and beachballs) and treats: dried fruits, especially something called craisins. I googled craisins and couldn’t find a place to buy them. Apparently I live in the city where you can get anything except craisins. The above link is from for an article in the NYT Magazine Section entitled “Planet of the Retired Apes” dated Jul 24,2005 by Charles Siebert. A different rescue group is mentioned within the article text that is also working toward the same end. When I read this piece last summer, I couln’t help but think about the fact that many ex-Nazis were involved in the nascent stages of the space program. Perhaps, that bit of history explains everything. 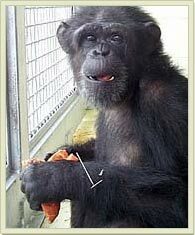 I would love to volunteer at one of these chimp rescue places.